How to Transfer Music from Computer to Android? Home > Resources > Backup Android > How to Transfer Music from Computer to Android? Many people enjoy wonderful music when they are traveling or taking a subway after getting off the work. Smart phone has been a useful music player. If you have collected or created beautiful melody on your computer and want to transfer it to Android phone, what can you do? This article gives 5 methods to transfer music from computer to Android. Additional: How to Transfer Music from Android to Mac? Android Music Transfer - Samsung Messages Backup is a professional Android data manager, aiming to help users manage their Android devices on computer. Two versions were developed for Windows and Mac. 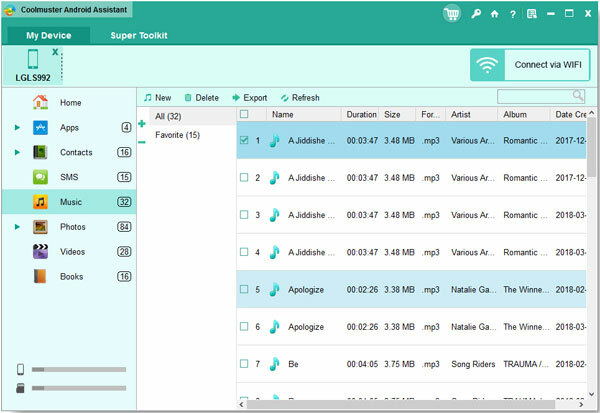 With it, you can transfer music from Windows or Mac to Android device easily. Also, you can manage other Android files on computer as well as backup and restore your phone with Samsung Messages Backup. 1. Supports many kinds of files, like music, photos, videos, call logs, text messages, contacts and apps. 2. Delete/ import music, videos and photos in batches on computer. 3. Edit and send text messages on computer, delete/ export messages in batches. 3. Delete/ import contacts in batches and edit contacts on computer. 5. Backup/ restore your whole Android phone with simply click once. 6. Supports almost all Android phones. How to transfer music from Windows PC to Android? Step 1. Download and install Samsung Messages Backup for Windows to your computer. Step 2. Launch the program and connect your Android phone to computer via a USB cable. Prompts about how to enable USB debugging will appear on the following interface. Just do as the guidance and go on. Step 3. Once your device is detected, a list of files will display on the left panel. You enter the main screen now. Please open the "Music" folder, click "New" from the top menu bar to select and import music files from your computer to Android phone. After that, tap on "Refresh" and you can enjoy the transferred music on your mobile phone. What's the Best Music Downloader for Android Phones? You can backup your whole Android phone with one click. Please go to "Super Toolkit" > "Backup" > choose the location > tap on "Back Up". How to transfer music from Mac to Android? You can please download Samsung Messages Backup for Mac, install it on Mac computer. The rest things to do are the same as transferring music from Windows computer to Android. Besides, you can backup your Android phone to Mac by click once only. The program supports almost all Android brands with Android version 2.0 to Android 9.0, such as Samsung Galaxy S9+/ S9/ Galaxy Note9/ Note8, HTC U12+/ U11 EYEs, Motorola z3/ z2 play/ e5 plus, LG Q7+/ Q6, SONY Xperia XZ2 Premium/ Xperia XZ2 and so on. This is an easy way to transfer music from computer to Android phone. You can connect your Android device to computer via a USB cable, select music files from local folder, copy and paste them to your device. Step 1. Connect your Android device to PC via a USB cable. Step 2. Slide your finger downwards from the top of the phone screen, tap the connection icon and choose the MTP mode. Step 3. Select music files from your local folder and copy them. Step 4. Please go to "My computer" > "Portable Devices" to find your Android device, and double click it. Then tap on "Internal shared storage" to find "Music" folder. Open it and paste the copied music files into this folder. It will take a while for the music transferring, please do not disconnect your Android phone until the process is completed. After that, you can enjoy the transferred music on your Android phone. Step 1. To transfer music from Mac to Android, you need to install Android File Transfer on your Mac. Step 2. Connect your Android device to Mac via a USB cable. Step 4. Please go to "Android File Transfer" to find the "Music" folder on your Android device, open it and paste the copied music files into this folder. In this way, you need to turn on the Bluetooth both on your computer and Android device. Then make a connection and send the music files from local folder to your Android phone. Please make sure first that your computer has installed Bluetooth device. Please notice that Bluetooth for Mac can not use for Android devices, so this method can only be used on Windows computer. Step 1. Turn on "Bluetooth" on your Android phone, please tick on "Shown to all" option so that your computer could find it. Step 2. Turn on "Bluetooth" on your computer, then please go to "Control Panel" > "Hardware and Sound" > "Devices and Printers" > "Add a Bluetooth device", choose your device from the results displayed by Windows computer. Step 3. Just follow the simple prompts to pair your computer and Android device, please confirm the code given by computer is matched with Android device. Step 4. Select music files from local folder and send them to your Android device by Bluetooth, click "Accept" on your Android phone to receive these music files, and you can enjoy them on your mobile phone when the process is completed. Many desktop applications with cloud service can be used to sync data from computer to Android. Google Play Music is one of them. You can use Google Play Music for Chrome to upload music from Windows/ Mac to cloud and sync them to your Android device. It allows you to upload up to 50,000 songs without any cost. Step 1. Please install the latest version of Google Chrome. Step 2. Please add Google Play Music to your Chrome. Step 3. Sign into the Chrome using the account that you used for Google Play Music. Step 4. Please go to Google Play Music Web Player in Chrome. Step 5. Click the "Menu" > "Upload Music". Step 6. Select the music from local folder, drag and drop them into the upload window. Step 7. Run the Google Play Music on your Android. Please go to "Menu" > "Music library" > select the transferred music and tap on the three-point button > "Download" to download songs to your device. In this way, you can log in your Email account on web browser on your computer, write a mail and attach the music you would like to transfer, then send it to yourself. Next, log in the Email account on your Android device using the same address and password you have used to send an Email on computer. Find the Email you sent to yourself just now. Then download the attached music to your Android device. If you own a Mac computer instead of Windows PC, you may always like to transfer music from Android to Mac. What's more, if you like to backup your Android phone to Mac, does any method mentioned above can help? Actually, you can use Android File Transfer to transfer data between Android device and Mac via a USB cable. But it is a bit hard to find out the files from so many folders which named unfriendly for users. However, an user-friendly Android data transfer - Samsung Messages Backup for Mac can remove this embarrassment. With it, you can preview the files content and transfer music from Android to Mac following the simple prompts. It is easy enough for each Android user to navigate with step by step. Step 1. Download and install Samsung Messages Backup for Mac. Please open the "Music" folder, click "Export" from the top menu bar, select and transfer music files from your Android phone to computer. Step 4. You can backup your Android phone to Mac with one click. Please go to "Super Toolkit" > "Backup" > choose the location > tap on "Backup".